Home > Dot Coms / Internet > Zeros & Ones, Inc. Beautifully engraved certificate from the Zeros & Ones, Inc. This historic document has an ornate border around it. This item has the printed signatures of the Company’s Chairman & CEO ( Robert J. Holtz ) and Secretary. Zeros & Ones is a concentration of expert talent, proprietary technology, and intellectual property focused on the powerful world-expanding opportunities of digital convergence. It owns and operates businesses that serve both the high-technology and entertainment industries because of a core belief that the future for each market lies in the combination of the two. 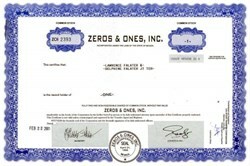 Founded on April 4, 1994, Zeros & Ones is rich with history. It was one of the very first companies to participate in the commercial explosion of The Internet and has survived through the rise, zenith, and fall of the dot-com era. Founder and Chairman, Robert J. Holtz, established the company as the natural progression of his successful career as a developer of pre-Internet distributed networked business systems. Holtz, already an established leader in the field, quickly recognized the future potential of worldwide connectivity and formed a unique group of world class talented technologists, artists, and strategists to harness that potential. Zeros & Ones is regarded as one of the few pioneers still standing that was "there when it all began" as one of the very first strategic partners of Netscape Communications, the company responsible for the rampant proliferation of the World Wide Web. Zeros & Ones participated in the specification of "ONE" (Open Network Environment) which came to serve as the blueprint for fundamental concepts that made The Internet what it is today. One of Microsoft's first alliances in the Internet arena, as well as one of the earliest official Microsoft TV Content Developers, is Zeros & Ones. We were involved in the explosion of Java, from Sun Microsystems, as one of the first proponents that introduced it to the development community. We were development partners of WebTV at their inception and have countless other industry firsts to our name. Having worked on the very building blocks of the modern Internet uniquely qualifies us as experts in the broadband future. From 1996 to 1999, Zeros & Ones made a number of strategic acquisitions: Studio Subzero (an award-winning website design firm whose noteworthy clients included Moviefone, Walt Disney Imagineering, EMI Classics, Bandai Electronics, Creative Labs, and Caruso Affiliated Holdings), Polygonal Research Corporation (creator of several key technologies in advanced image recognition and wireless data applications), EKO Corporation (developers of a sophisticated collaboration, community, and commerce code base developed for an entertainment industry business-to-business application), Pillar West Entertainment (a youth markets edutainment company), Quantum Arts, Inc. (a multimedia CD-ROM content developer and designer of a binocular lens system geared to digital television), and Wood Ranch Technology Group (designer of an advanced media production center) along with its subsidiary Digital Video Engineering (a systems integration and television engineering company). All operations of these entities were consolidated in July of 1999 when a reverse-merger was completed with Commercial Labor Management Inc. (CLMI) which thereby resulted in a single combined publicly-held entity trading on the over the counter bulletin board under the symbol ZOZO. In February of 2000, the Company executed a 3-for-1 stock split and changed its trading symbol to ZROS. It simultaneously closed its first round of funding of $7.5 million dollars. In September of 2000, it was organized into divisions targeted at the three major aspects of its offerings: Zeros & Ones Technologies, Zeros & Ones Studios, and Zeros & Ones Entertainment. Company history is from press information.